This article explains the Mobile Rendering of RadWizard control. The RadWizard Mobile rendering mode is specifically designed to be used in mobile devices where its behavior is relatively different from the one on a desktop device. This is controlled through their RenderMode property. With the Mobile rendering of the RadWizard you will have a specific functionality: to display the current active step index. This functionality will be enabled automatically only when the sum of each WizardStep width exceeds the overall RadWizard width. In this case the control shows a horizontal scroll bar in order to navigate to specific step that is not visible at the moment. In the upper right corner of the screen there is a little box displaying the active step index as shown in the screen shot below. 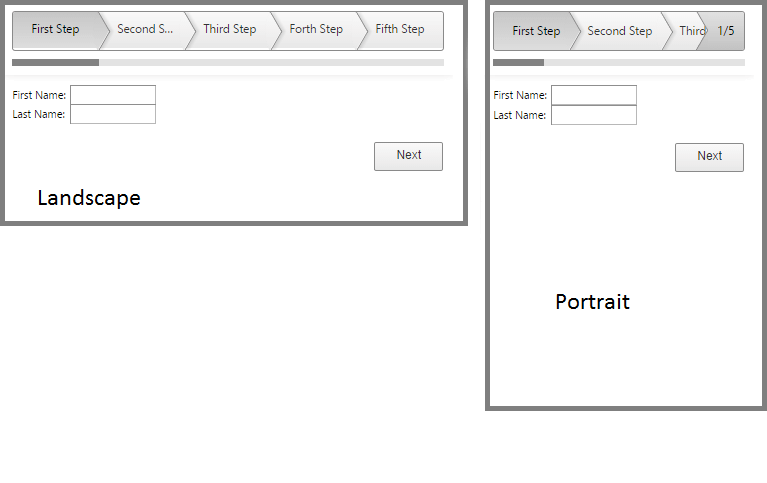 Example 3: How to set the mobile rendering for the RadWizard. RadWizard supports changing the rendering if user switch from portrait to landscape orientation or vice versa. For example if in portrait mode sum of each WizardStep width exceeds the overall RadWizard width the control shows a horizontal scrollbar and indicate the active step index. If you change the device orientation and the RadWizard width exceeds the sum of all WizardStep width the scroll bar and the little box will be hidden.